Islay has the highest proportion of Malt Whisky Distilleries per head of population in the world. And because the traditional way of getting ingredients in and whisky out of each distillery was by puffer, with the exception of Islay's newest distillery at Kilchoman, all the distilleries are sighted at the water's edge. Our most popular trip leaves Port Ellen harbour travelling along the south of the island passing Laphroaig, Lagavulin and Ardbeg distilleries, as well as Texa island with its wild goats and rugged sea cliffs and the seals at the south east island skerries. We then turn north into the Sound of Islay and head up past Port Askaig to Caol Ila distillery before moving on to Bunnahabhain, the most northerly of Islay's distilleries. On the return journey down the Sound we visit Jura distillery at Craighouse. It is possible to go ashore at Craighouse for refreshments in Jura Hotel, or wait until we are back at Islay's coast and drop in at the Old Kiln Cafe at Ardbeg. Islay's other two distilleries at Bruichladdich and Bowmore are situated on the shores of Loch Indaal and this would generally be undertaken as a separate trip. 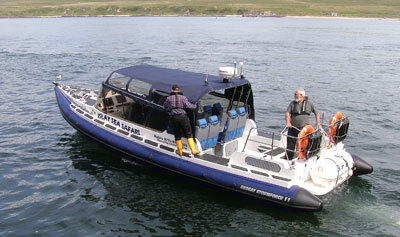 This can be expensive for two distilleries since we are required to round the Mull of Oa into Loch Indaal and is therefore a trip that must be made by special arrangement. The three southernmost distilleries can generally be covered in around an hour at a cost of £25 per person. The addition of Caol Ila, Bunnahabhain and Jura take us over the two hour mark and costs approx £40 per person. Contact us for further details. Please note that we do not alight at any of the distilleries for tours. The above are viewing trips only. Refreshments are not included in the price.